Welcome to the brokerage section of nordhavneurope.com. We have prepared our listings by region for your convenience, or you can click on the entire list. We invite you toread through the following listings (updated regularly) and take note of what type of features and equipment are installed. By studying the details in our brokerage offerings, browsing the other areas of this website and reviewing your questions with a Nordhavn sales professional, you will be in the best position to make your dreams come true. Nordhavns are very specialized yachts. Each of our full displacement models is developed for ocean crossing performance and features solid fiberglass hulls, Portuguese bridge decks and engineered systems to assure reliability. Purchasing a yacht that will carry you across oceans should not be entered into lightly, or alone. We have a sales staff comprised of two dozen experts who can and should be involved to insure you take advantage of the knowledge you need and are given proper guidance to make the most of your purchase. Brokerage (used) Nordhavns are a large and important part of our business and each sales associate is a trained professional with years (sometimes decades) of boating knowledge and hundreds of hours at sea aboard our yachts. Working with someone who has already “been there and done that” will make your buying experience much more satisfying and will likely develop into a lasting friendship. Yes, we also build new yachts (and often times many of the boats available as today’s used Nordhavns are put up for sale because their sellers are already planning for their next new Nordhavn!). Each Nordhavn design has had a natural evolution as we continually upgrade and improve all aspects of the build process. What should you be looking for when comparing different model years? All new Nordhavns are sold by our company directly to individuals (there are no dealers or middlemen). We spend months going over details with each client to ensure the end product is optimized for the type of cruising intended. Buy the smallest boat that is big enough (get on as many boats as you can to see how you fit and what you need). Most clients are happier if they can find a smaller boat at a lower price than stretching to afford a larger Nordhavn that is more costly to maintain and puts a strain on their budget. Only you can make this assessment and it can only be accomplished by getting aboard as many Nordhavns as possible. 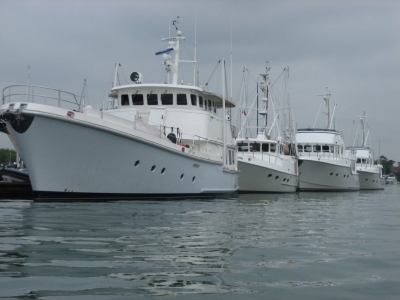 Study the used Nordhavn market carefully; your best value will be a well maintained brokerage boat. Buying used saves you time and money plus you get to see exactly what you are getting and have the advantages of knowing what to expect as a result of your surveyor’s findings. You may determine that a new boat is your best course, and, if so, you will know exactly what you want. When you have settled on a model and are ready to make an offer we have the legal forms and a secure brokerage trust account to protect you during this process. Neil and Phil specialize in this market and know what comparable boats have sold for and can help you negotiate the best price. Buying a used Nordhavn and spending a considerable sum for that privilege can be a stressful process with a lot of decisions to be made in a compressed time frame; we are trained to help make this a pleasurable experience. We can help you prepare by putting you in touch with the top legal, insurance and finance experts in our field. We can also connect you with current Nordhavn owners to seek their advice and solicit their opinions on what works and what doesn’t. And, often times, a Nordhavn changes hands yet never comes up on the open market. We know who is planning to sell and who is looking for their boat well in advance and can give you inside information to react swiftly. Independent yacht brokers may not have the product knowledge or depth of experience to help you navigate through all of your choices. Each Nordhavn sales person is actively involved with Nordhavn – every day! We know what is happening and what is going to happen. We can show you new boats and used boats and constructively compare the differences to help you make an informed decision. Nordhavn sales reps have new and used Nordhavns at their sales docks and can set up appointments for you to view any Nordhavn available anywhere in the world. Training is another key component to enjoying your new Nordhavn. From docking, anchoring and basic operations to engine checks and fuel transferring you deserve to learn first hand from an experienced professional. Reviewing the comprehensive Nordhavn operator’s manual (delivered with each new Nordhavn built since 2000) is very reassuring. Your Nordhavn sales representative can also provide you access to spare parts, upgrade recommendations and question time with the project managers. There is a lot to gain by working your purchase through Nordhavn including gaining the experience and confidence to know that you ARE ready to take off on your own. Perhaps the best part of all is that it doesn’t cost you a penny more to have Nordhavn Europe on your side. The seller pays the commission and you as the buyer not only get a great deal on the boat; you get a great deal of support that is not available anywhere else.